January brought the new year and I feel ready for 2018! More importantly, January meant our little man turned 3! I can’t believe it! 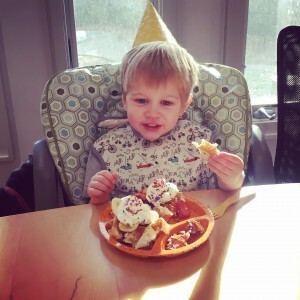 We had a fun birthday party with a waffle bar! I meant to blog it and really wanted to, but being in the moment, not rushing to prep before the fam arrived, and paying attention to the birthday boy were all more important. 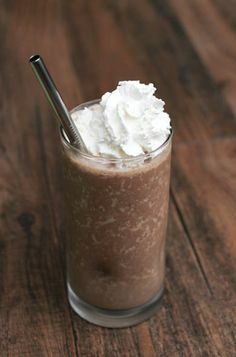 I’m totally into jazzed up hot chocolate. I made a Hot Chocolate with Raspberry and White Chocolate. So good. It started when NYE was just too cold for our traditional milkshakes so we went for hot chocolate with toppings. I have more ideas ahead, stay tuned! 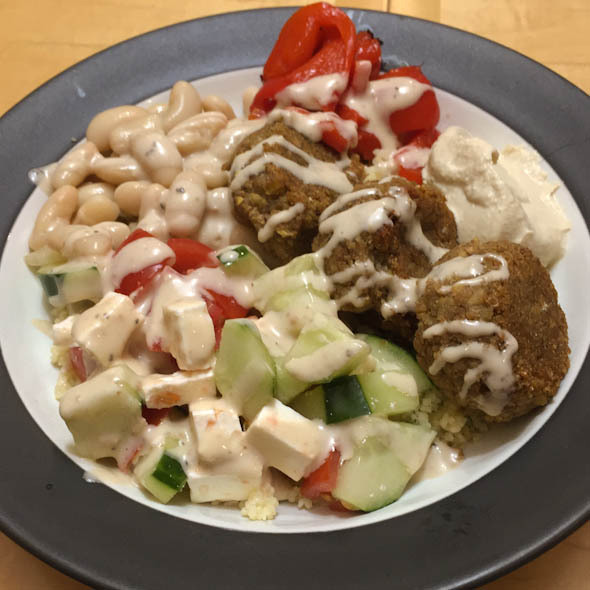 #MeatlessMondays are a thing here for the last few months so I did a meatless Monday round up. 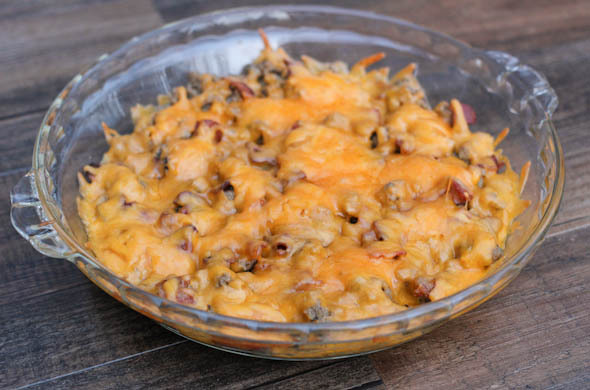 I was really excited to make this Cheeseburger Layer Dip, especially in time for the superbowl! He’s so big! He was proud to show his new age with his fingers. He was pretty amped up during his family party and after his nap he was so much calmer and focused. We’ve been playing a lot of trains and play doh. I was glad we could capitalize on any days that weren’t too cold. Getting outside is so important. 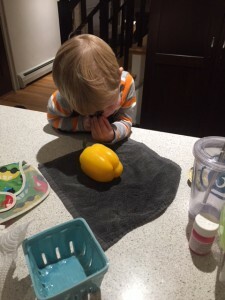 Food-wise, he was into tacos and a dinner of white bean/tomato/spinach with polenta. Year of the candle: Yup, mint chocolate candle for this chilly month. 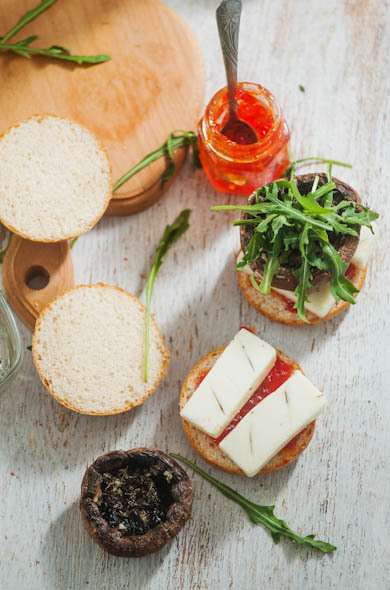 Cook more appetizers/snacks: Yes! I made 2! I made caesar deviled eggs and cheeseburger layer dip! Taking time to blog thoughtfully: ehh. What I’m reading: I read Necessary Lies and zoomed through it. I’m pretty far into my next one. What I’m watching: This is Us, the Superbowl (for the snacks), and The Amazing Race. We watched a few movies: Stronger & Battle of the Sexes. “The Big Game” is fast approaching! I’m a bit more focused on the snacks, halftime show, and commercials with a lesser priority being the actual game. Can I say that in New England? It is the truth. I’m really just here for the snacks. Playoff games have been especially helpful for that! 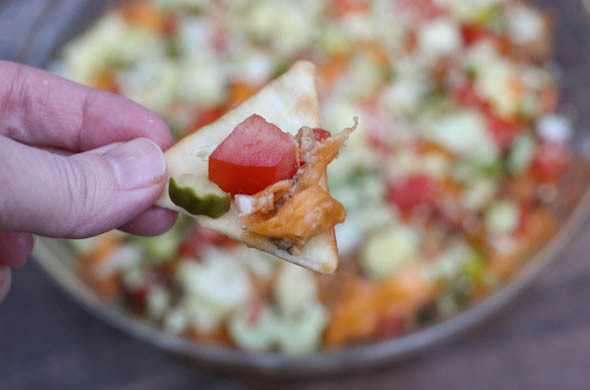 Just the other night I whipped up this cheeseburger layer dip as dinner during the game. Maybe it was good luck? Saute the ground meat in a large pan, and add in the liquid smoke, minced onion, ground mustard, and seasoning for the last minute of cooking. Chop the bacon into a hot pan and fry until crisp. Drain on paper towel. 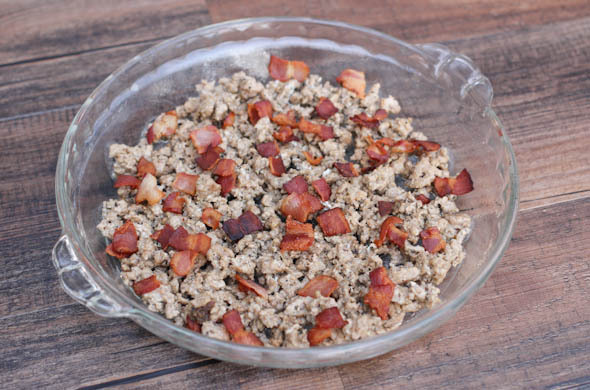 Spray a baking dish with non-stick spray and put the ground meat on the bottom and the crisp bacon on top. Add on a drizzle of special sauce. Then sprinkle the cheese on top and bake for 10 minutes to melt. While the dip is in the oven, chop the toppings. Take the dip out of the oven for ~5 minutes before adding toppings. 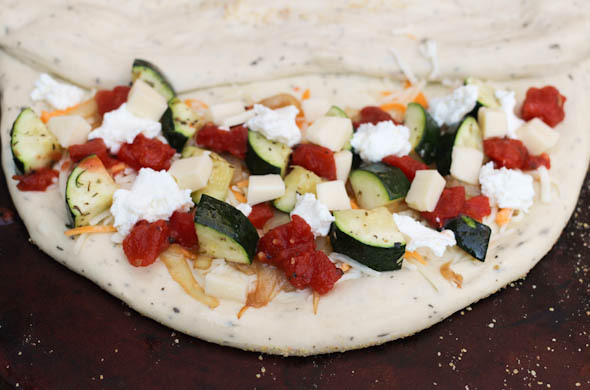 It should be warm, but not hot to wilt all the toppings. 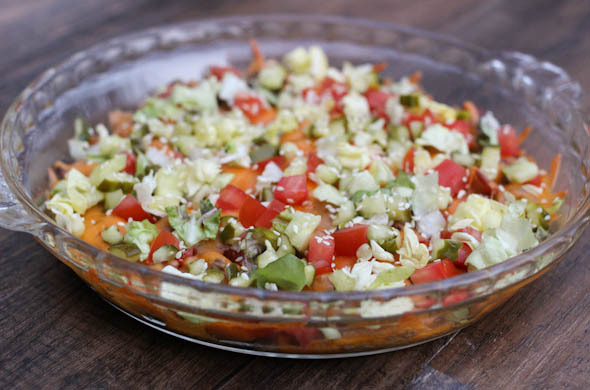 Sprinkle on the lettuce, tomato, pickles, and sesame seeds. Serve with crackers, chips, or bread to dip. This was so fun! It was our dinner of “sports snacks”. The little one totally go it, but asked for a spoon and seemed to enjoy in a bowl rather than dipped. Add this to your menu, especially if you already have spinach and artichoke dip and nachos. I love the cool toppings with warm and cheesy dip. Perfect! What are you serving for the game? 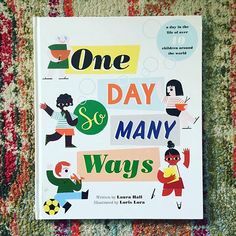 I’m so psyched to share this guest post with you today! I’d totally order this if I saw it on a menu too! This is such great timing because winter calls for flavor and decadence. These photos have me drooling. Sign me up. 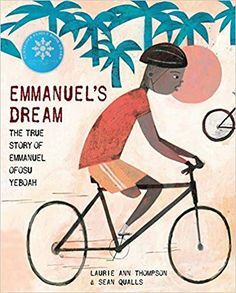 About the author: Ben is a former semi-pro cyclist and big eater. Now he is just a big eater. He writes about food and drink for lazy chefs at The Online Grill. Here you go! I’m an easy meal obsessive. Some people interpret that as ‘lazy’, and they might be right, but I prefer to say that I’m just more efficient. 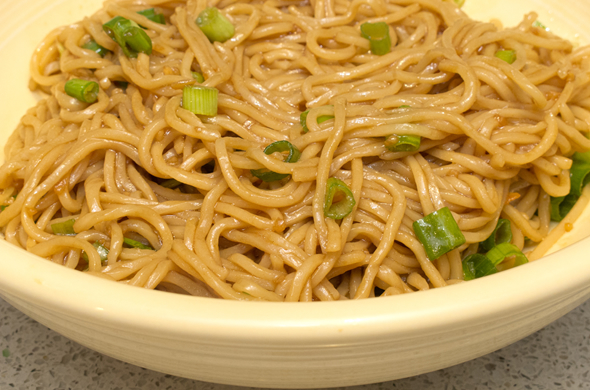 I like my recipes quick and simple, and today’s recipe is no exception. Lately I’ve been going through a stage of trying to reimagine popular recipes for vegetarians. 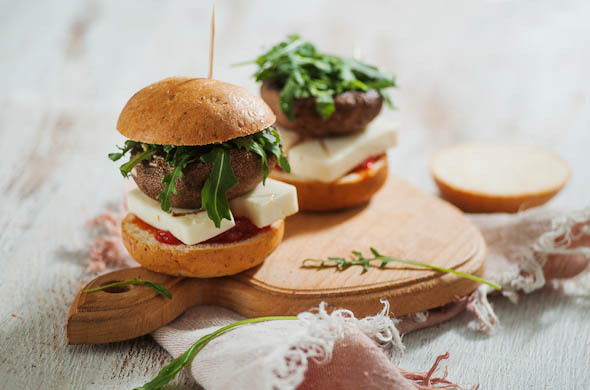 From breakfast egg pizzas to spicy quorn avocado wraps, I’ve been adamant to prove that meat-free options are in no way inferior to their non-vegetarian counterparts. 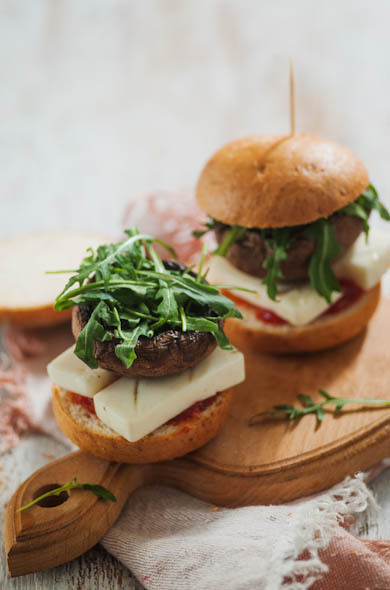 Perhaps this recipe today is the best example of that: Portobello mushroom burgers. I tried these at a restaurant in London last week, and at the time the only reason I chose it is because it looked like the only thing on the menu that wouldn’t give me a heart attack. I was right, and having survived I knew that I wanted to recreate this recipe as soon as possible. It’s been a week and I’ve already made it twice. I’m completely hooked. This recipe is my favourite thing to cook at the moment, and pretty soon it will be yours too. So what makes this so good? Its beautiful blend of spice, herbs and honey makes it a tangy and sweet blend of pure awesomeness. 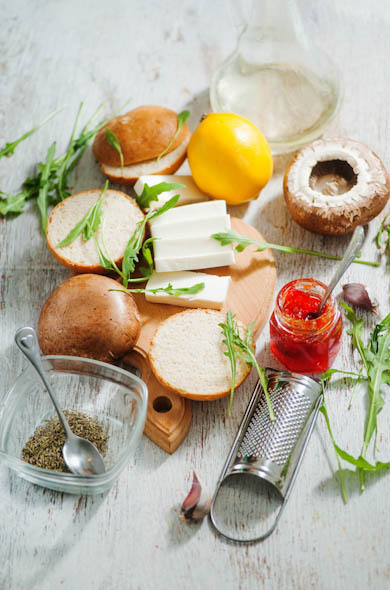 Plus it packs in haloumi – my favourite meal cheese. 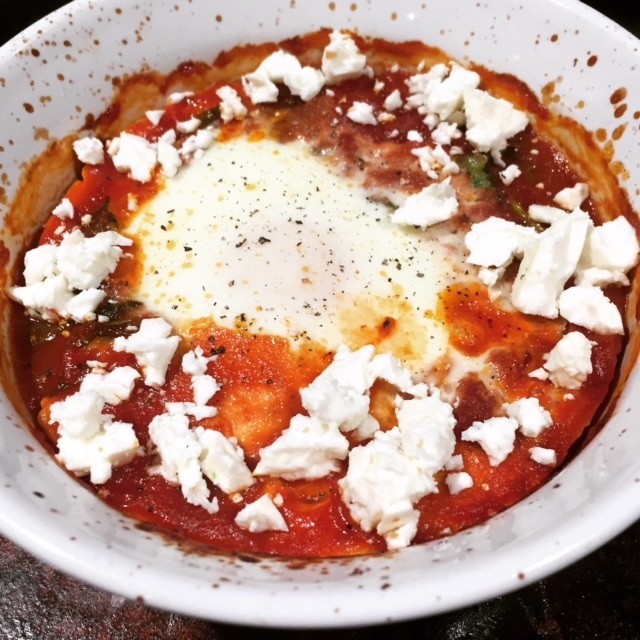 I’m really excited to share this recipe with you guys, so do please let me know what you think! I’d love to know if any of you have made any variations of it, and I’m keen to find out if any of you don’t like haloumi… because I don’t think that such a person exists. Heat up the oil in a frying pan on a medium heat. While it’s heating up, mash the avocado in a bowl with a fork or (my personal favourite) a potato masher. Once it reaches a good consistency, drizzle it with half the lemon juice and set aside or in your fridge. Add the mushrooms to the frying pan. Cook for about 5 minutes, turning halfway through, or until slightly softened. Add a little more oil to the pan (still with the mushrooms in) and add the thyme, garlic, chilli, lemon zest and remaining lemon juice. Cook for a couple of minutes, coating the mushrooms in the ingredients. 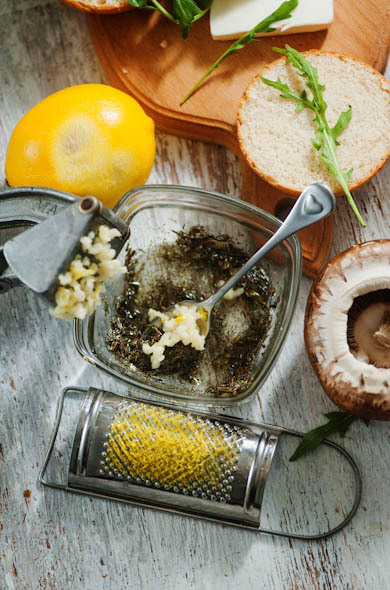 Add the honey, vinegar and ½ tsp salt and cook for a further minute, ensuring the mushrooms are as coated as possible. Then remove the pan from heat and set to one side, heat up a second frying pan to a medium-high heat and add the haloumi. Turn frequently and cook for between 2-4 minutes, until golden. Lightly toast the buns either in a toaster or under the grill. 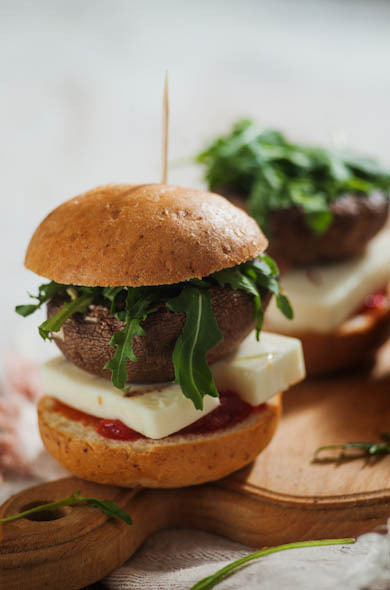 Add the avocado between the bun bases, and top with a mushroom each, as well as the haloumi, rocket, mayo and bun tops. New England’s frigid temps lately have been ohh so freezing and inspiring all the cozy. I feel accomplished that the little one knows after playing in the snow, the next activity is to: get cozy on the couch…blankets, books, and snuggles. While today might feel like spring here in New England, 50s! Woah! I know there’s some more chilly temps ahead. Thus, where my hot chocolate with raspberry & white chocolate comes in! None for the little one, but I know this’ll be dessert on the couch, some night in the near future again! 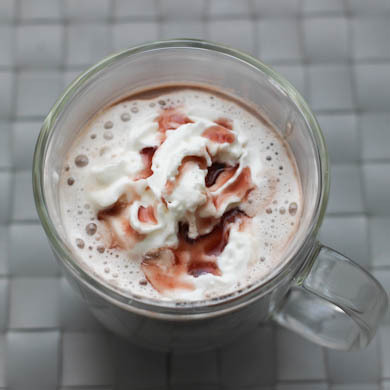 This recipe has a few specialty ingredients…which I know I don’t love when I see them in recipes- the white hot chocolate & the raspberry syrup. I’m including a few work-around below if an an alternative is helpful. 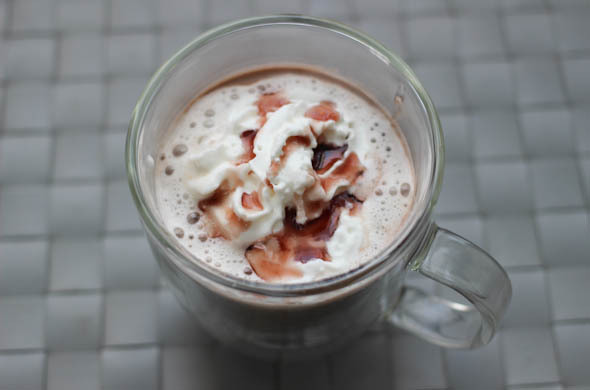 Heat water to warm but not boiling & mix in hot chocolate and white hot chocolate. Stir well. Gently press the raspberries with a spoon to break them down a bit and mix the raspberries & 1 teaspoon of syrup into the hot chocolate. Add whipped cream & 1 teaspoon of raspberry syrup. white hot chocolate mix: I used this – partly because we had it. It is a delight in coffee (hot & iced), but peek at the grocery store, or amazon has millions. It feels like it lasts forever. Stir in a few white chocolate chips if that feels easier! 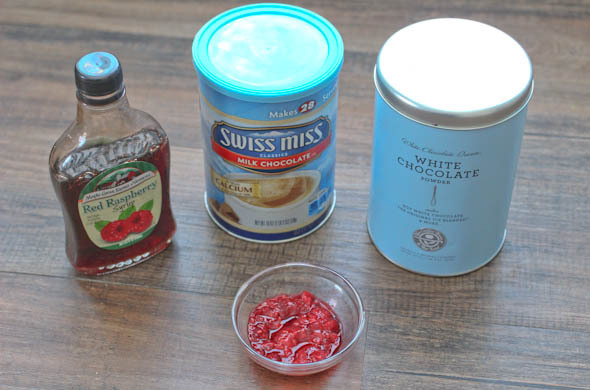 raspberry syrup: I used this – because we also have it for pancakes/waffles. Another idea would be to boil some raspberries with a splash of water & then strain. LOVED the subtle white chocolate in there. Go full white hot chocolate if that’s your thing. I thought it might be too sweet for me, but it sure would be pretty! Now that you have your hands wrapped around a cozy drink, is your couch getting as much cozy time as mine? I quietly instituted Meatless Mondays at our house. I sort of regularly planned or scheduled a meatless meal during our week but back in November I consciously planned them for Mondays and tried to keep them varied. 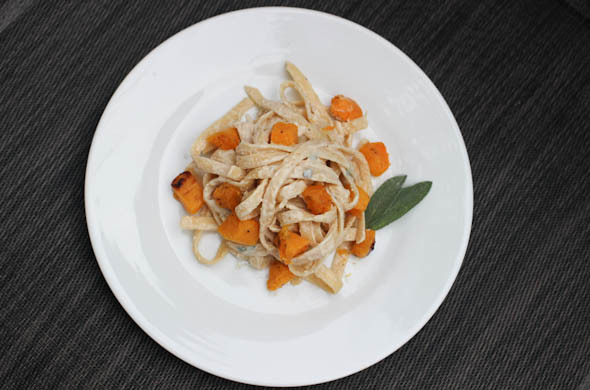 I mean, pasta seems like the easiest & fastest dinner without meat and is a favorite food of mine so I might have been happy to eat pasta every Monday night! There were still a bunch of pastas on my Mondays but everything has felt different so far! Summer definitely seems like an easier season but it is a good habit I hope to keep up. The verdict? So far so good! They don’t have to be Mondays necessarily, but I did totally find it helpful for speedier meals to start the week! I’ll keep at it and maybe it’ll stretch me to be more creative. We could definitely eat more veggies. Bean & Cheese Quesadillas/Burritos – I froze a few burritos with beans, 2 cheeses, brown rice, and corn for lunches too! Spaghetti w/ Tomato Sauce- I was solo parenting and had strep- the worsttttt. A 2-ingredient dinner was perfect- using my fav Kitchen Ready Tomatoes of course. 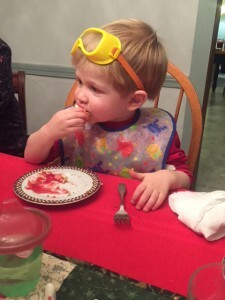 Grilled cheese & Tomato Soup – this may have been the first time the little one ate soup. He was into it! I think that’s been most of them so far. It was also refreshing for a busy season to rely on many tried and true favs and not focus on new concepts and blogging all of them. A bunch of my lunches tend to be vegetarian- quiche, soup, crostini, jazzy grilled cheeses, etc but it was good to be mindful to focus dinners around the theme. A few other ideas that’ll hit next are some pizzas/flatbreads, Mexican things, more soups, and eggplant. I’m just not craving salads while it is 10-degrees around these parts. Any other cold-weather meatless meal ideas for me? Fish & mushrooms aren’t always favorites for all of us at our house. At the first Pear Party/Iron Chef Pear, there was this pear, pomegranate pearl salsa that I loved, yet hadn’t made in years. It is so addicting with tortilla chips- multigrain scoops are definitely the best for it. 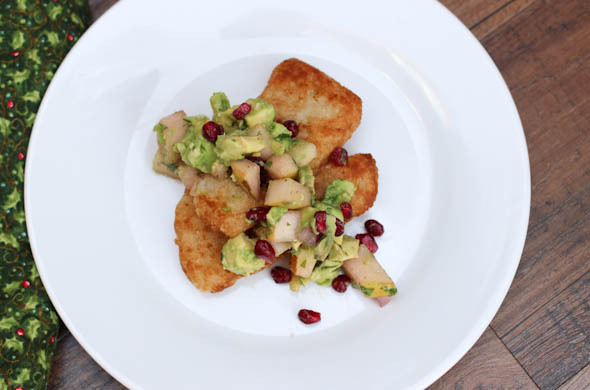 I added some avocado and served mine on top of some beer battered fish filets for lunch and used the rest on pork tacos the following night. 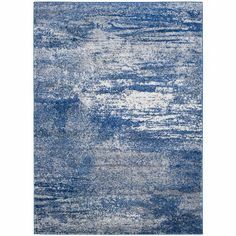 This is wintry and fresh with such great textures. 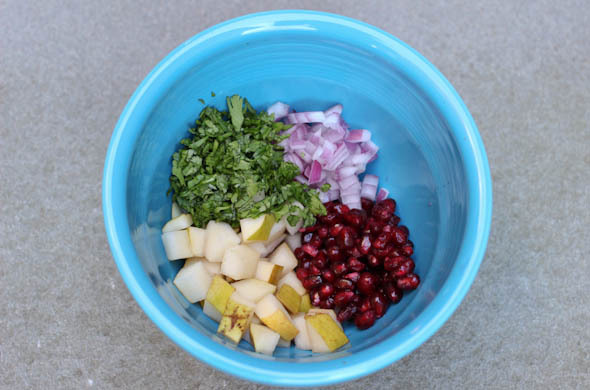 Chop the pear, cilantro, and red onion. Mix together with the pomegranate pearls, lime juice & salt. Gently mix in the avocado. So easy! You know what’s even easier? I discovered the grocery store sells the pomegranate pearls already popped out of the pomegranate! That was my hang up to make this until now. 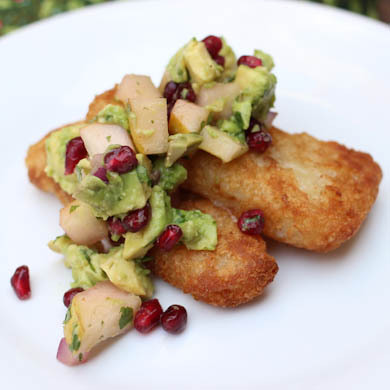 This lunch as everything: warm crispy fish, the pop/crunch of the pomegranate pearl, the juicy pear, the creamy avocado. What’s not to love? The red & green felt super cute and seasonal here. The avocado was a game-time decision. When they’re ripe that window to use it or lose it is brief! Plus, my frozen fish filets seemed tiny. I’ve used them in fish tacos but for size reference, this is a salad plate so I thought the avocado would bulk it up a touch. It did! 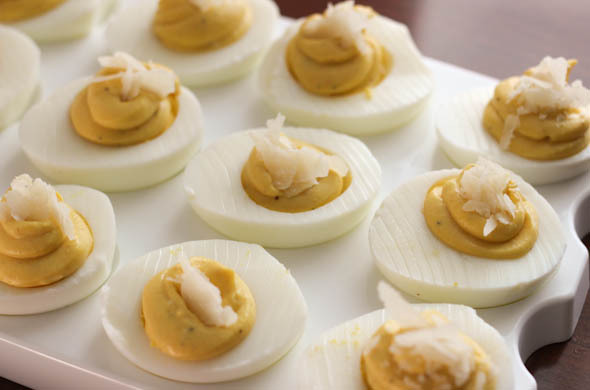 I love caesar dressing which lead me to a caesar twist on deviled eggs. 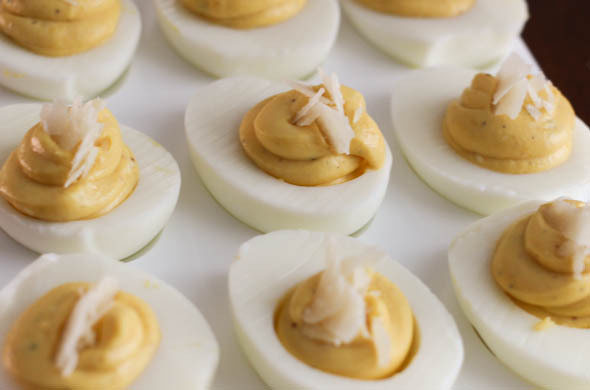 I made just a few for a mid-day Christmas appetizer. They were perfect for a few bites with the zing of caesar and a salty bit of Parmesan on top. I also like that they’re quick and easy to make a few or a bunch. I like them as an appetizer in contrast to dips, cheese, crackers, etc. I jazzed up some creamy caesar dressing but it is also pretty easy to make it homemade. They definitely taste caesar-y. The anchovy paste is necessary in the dressing. Necessary. It adds that hard-to-explain, not-fishy, but zing of good caesar flavor. I doubt these would really taste like caesar without it. Hard boil the eggs, then immediately place into a ice bath. When cooled, peal the eggs and slice in half. 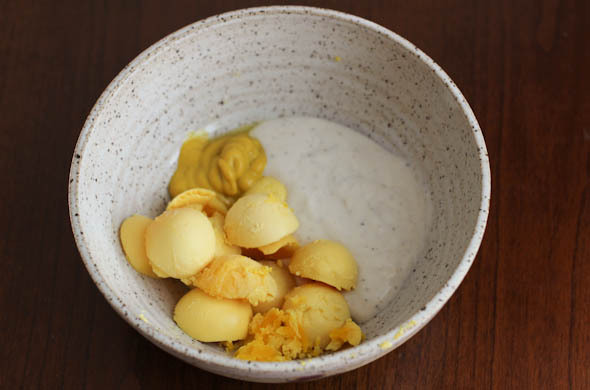 Pop out the egg yolks into a bowl and add in the mustard and creamy caesar. 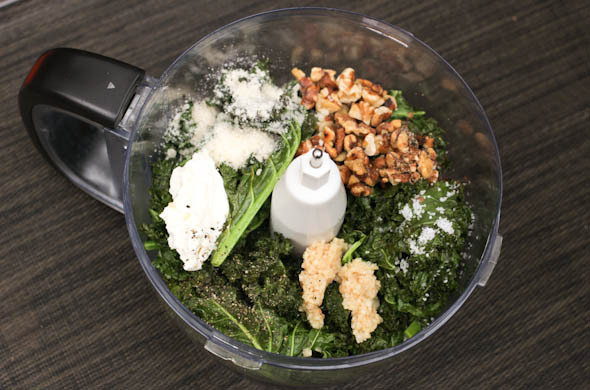 Whip together with a hand mixer or in a food processor until totally smooth. Spoon into a ziplock bag. Then pipe the filling into each egg half. Sprinkle with parmesan cheese. Enjoy! 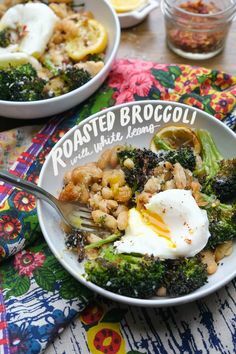 I was making these on-the-go bringing ingredients to our Christmas celebration, but a tiny piece of romaine lettuce would be fun for crunch or some crumbled croutons all over the top would be good too!